An administrator can create items in their own district item bank, and share those items with teachers in their district, or reserve them for administrators. This article will walk you through the process of adding an item to a district item bank. For information on how to add a specific item type, take a look at the Item Bank Questions page in our Help Center. For more information on how to reserve or release an item, please see our Help article Reserve or Release Items from an Item Bank. Click on Admin, then click Item Bank in the sub navigation bar. Click on the title of your district item bank to open it. 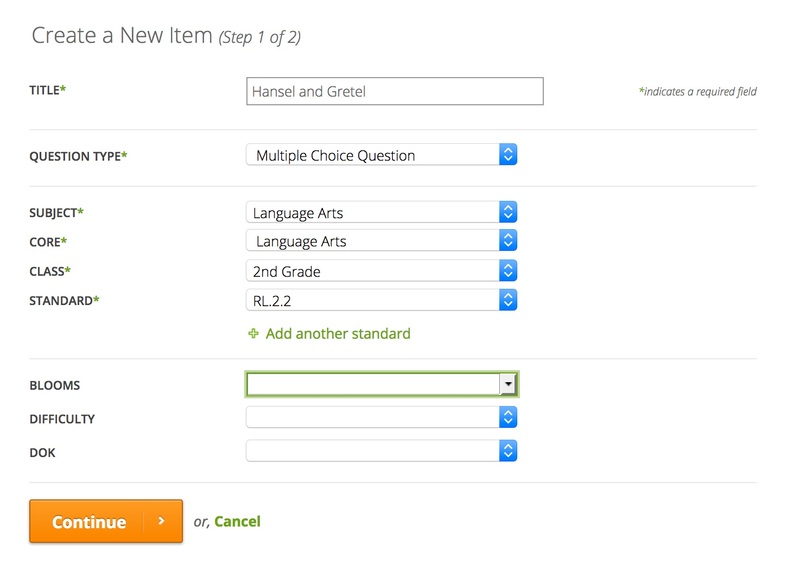 On the Create a New Item page, add a Title, select the Question Type, Subject, Core, Class, and Standard. To align the question to more than one standard, click Add another standard. You can also optionally add the Blooms, Difficulty, and DOK. The item is now added to the district item bank. Click here to learn how to continue creating your specific item type.